With art stretching from wall to wall, you could easily forget you were walking around a Facebook campus if it wasn’t for the occasional blue insignia we’ve all come to recognize. The Artist in Residency program has redefined “let’s make this office cool”, transforming the white walls and fluorescent lighting of a traditional office into a remarkably immersive workspace The program is interactive from install to completion, while encouraging creative freedom and providing the economic backing that supports both materials and a living wage for the artists. 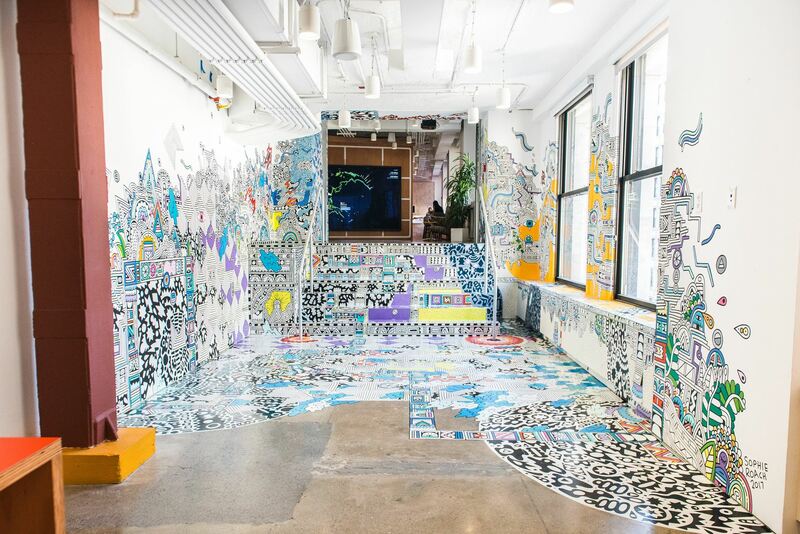 From a creative lab which holds classes and encourages employees to schedule hour long break to learn and experiment, to the handmade installations themselves, the FB Art Department encourages both real-time connection and expression. Pushing all of those who witness to realize emotions and projects they may not have otherwise. The pieces are often installed during construction. Times in which the campuses are filled with bodies focusing on code and algorithms, while let’s say, Xenobia Bailey crochet’s on the couch, is a physical manifestation relaying the power of the handmade human experience. Inspiring both discoveries of self and empathy for others. The focus and celebration of human interaction are at the center of Facebook’s mission. The program’s simultaneous integration and support of the arts within company culture while reaching out to the local community is something Facebook plans to share with the city. Previously Facebook partnered with Pioneer Works supporting their Second Sundays initiative. This spring, the company is launching a project with the NY Parks Department, refurbishing two basketball courts in the city with the help of two of their artists. Adrian 'Viajero' Roman's "De Aqui Y De Allá (From Here and From There)" is a multi-media installation and series of workshops in collaboration with Loisada Center that celebrates Puerto Rican history, both on the island of Puerto Rico and in New York City. With the current (economic, social, political, healthcare, education) crisis threatening the island of Puerto Rico, the project seeks to delve into an exploration of the forced migration of hundreds of thousands of Puerto Ricans to the United States, and the survival of vibrancy in the time of such strife. Xenobia Bailey is best known for eclectic crocheted hats, large-scale mandalas, and tents consisting of bold, colorful circles, and repeating patterns. This installation is part of her long term project, Paradise Under Reconstruction in the Aesthetic of Funk. This installation was hand crocheted over the course of six months, she worked in and outside of the office. Sophie Roach is a self-taught artist and illustrator. Her abstract style is playful yet austere, extremely detailed and often vibrantly colored. For FBNY’s Partner Center, Sophie spent four weeks hand-painting this eye-popping environmental installation that abstractly references connectivity and network systems. Marc Andre Robinson uses traditional carpentry techniques to explore African American history through a contemporary lens. This site-specific explores the work is composed of the back legs of chairs—each chair carrying traces of their former owner, either through evidence of physical wear or the energy embedded within. A staple in most settings, chairs also denote social status, from the authority of a monarch seated on a throne. However, the many chair parts that compose the piece work suggest the possibility of multiple perspectives. While there is no current application process to become an artist in residence, the team of curators look on the level, not on social media for artists to feature. Pugh suggests being prolific and networking to get noticed.